NASA managers late today ruled out an attempt to launch the shuttle Atlantis Thursday but held open the possibility of a last-ditch Friday launching if engineers can resolve a problem with one of the ship's three electrical generators before time runs out. The decision came at the end of a long day of troubleshooting, engineering analysis and discussion in which LeRoy Cain, chairman of NASA's Mission Management Team, recommended proceeding with a launch try Thursday. 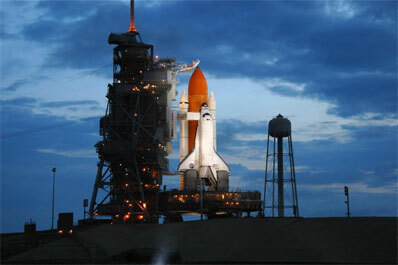 Shuttle Program Manager Wayne Hale and other senior agency officials disagreed and decided to err on the side of caution, ordering an additional 24-hour stand down. The shuttle's launch window closes Friday and there is no time to make any actual repairs to fuel cell No. 1, one of three compact powerplants under the floor of the orbiter's forward cargo bay that supply the electricity needed to power Atlantis' myriad electrical systems. If the engineering community can show the problem seen during launch preparations Tuesday and Wednesday won't get worse, NASA will proceed with an attempt to launch Atlantis Friday at 11:40:37 a.m. on a long-awaited space station assembly mission. Forecasters are predicting a 70 percent chance of good weather. The only other option is to replace the suspect fuel cell, which would delay liftoff until Oct. 26 barring a decision to relax a self-imposed requirement for a daylight launch. That requirement was put in place to permit photo documentation of the shuttle's heat shield and external fuel tank insulation and if it is waived, Atlantis could fly shortly after a Russian Soyuz spacecraft brings the space station's outgoing crew back to Earth Sept. 29. "If we get comfortable that this is safe and understood, then we'll go fly (Friday)," Hale said. "And if we don't get comfortable - take schedule out of this - if we don't get comfortable that it's safe to fly, we'll stand down and change the fuel cell out. "This is one of those really 50-50 kind of decisions," he added. "If you want high drama, this is about as good as it gets." NASA originally hoped to launch Atlantis Aug. 27, but the flight was delayed in the wake of a launch pad lightning strike Aug. 25 and then by tropical storm Ernesto. Thanks to an improved forecast and an unprecedented decision to reverse a move off the launch pad last week, Cain and Launch Director Mike Leinbach preserved three shots at launching Atlantis this week - Wednesday, Thursday or Friday - before the September launch window expires. During fuel cell activation late Tuesday evening for a planned Wednesday launch try, engineers noticed an electrical "signature" indicating a short circuit somewhere in fuel cell No. 1 that prevented one of three phases of AC power from reaching a Freon cooling pump. Because of concern about the unusual signature, mission managers put launch on hold pending additional analysis. The pump can run on normal two-phase power, but a subsequent failure would trigger a shut down and that, in turn, would force flight controllers to turn off the fuel cell to prevent over heating. Such a failure in orbit would trigger flight rules calling for a shortened, "minimum duration mission" and a quick return to Earth. The goal of Atlantis' mission is to install a $372 million solar array truss segment, a complex task requiring three spacewalks and intricate work on the ground to orchestrate station powerdowns while the new equipment is wired into the lab's electrical and cooling system. Going into the flight, NASA managers were preserving the option of extending the shuttle flight up to two days to permit additional heat shield inspections and to provide time to handle any unexpected assembly problems. A launch Friday alreaady would eliminate any extension days because of a NASA promise to the Russians that the shuttle will undock from the station by Sept. 17 at the latest, clearing the way for the Sept. 18 launch of a Soyuz carrying the space station's next crew. But a minimum duration flight, in a worst-case scenario, could force the crew to attach the new truss and then depart before completing all three planned spacewalks, causing a variety of downstream complications. After extensive analysis, some engineers concluded Atlantis could be safely launched Thursday and that whatever was causing the short in the coolant pump motor had little chance of causing any additional problems. Others wanted more time to confirm that conclusion. Cain, a former ascent/entry flight director serving as launch site chairman of the MMT for the first time, played a critical role keeping Atlantis on track for launch tries this week after the lightning strike and Ernesto. At the end of today's discussion, Cain wanted to proceed with a launch try Thursday, but Hale and other senior agency officials disagreed. "I'm a little disappointed to be here talking to you about this," Hale said late today. "I'd really hoped that I would be here doing a press conference at this hour telling you the results of launch. ... However, last night when we came in, or actually before most of the management team came in, when the fuel cells started up, there was an anomaly found in fuel cell No. 1. "It's a very interesting thing. We do not have a violation of the launch commit criteria, we have not violated any of our requirements. But as we looked very carefully at this scenario that played out over a couple of hours with fuel cell 1, we decided there are some liens against that particular piece of equipment. "The fuel cells generate the electricity for the shuttle, the shuttle requires electricity to fly and there are no batteries to speak of. So we're very interested in having good fuel cells. And again, the particular signature we saw was not a violation of our current launch rules but it did cause a great deal of engineering analysis to come back to say there is something funny going on in that fuel cell." The shuttle's fuel cells, built by UTC Power, are located under the ship's cargo bay floor. They each weigh 255 pounds and measure 14 inches high, 15 inches wide and 40 inches long. They combine oxygen and hydrogen in a sort of reverse hydrolysis to produce electricity and, as a byproduct, water. The fuel cells generate direct current that is routed through inverters to produce three-phase AC power. Normal household appliances run on two-phase AC power but the shuttle's systems use three-phase electricity to provide additional margin against failures. Some of that AC power is routed back to the fuel cells to drive coolant pumps and other devices. Fuel cell No. 1 is generating the proper amount of electricity but somewhere in the system, one phase of the returning AC power is being prevented from reaching the Freon coolant pump motor. Engineers need to make sure the vibration of launch won't cause additional electrical problems that, in some scenarios, could knock out one or more main engine computers. And they need to understand the consequences of a failure in orbit that could force flight controllers to shut down fuel cell No. 1, triggering a minimum duration mission. "The bottom line coming out of today's meeting is we decided it would be prudent for us to spend another 24 hours looking more closely at the engineering analysis to understand what we've got," Hale said. "I still am hopeful, and I certainly believe there's an opportunity to launch Friday morning." But, he added, "I would like to have a high degree of confidence that we are not at significant risk of incurring a minimum duration flight before we go launch. That's one of the things I'm going to be looking for the engineering team to come back and say we really think we have a good handle on this problem and it won't propagate to the next level and cost me several days off the flight." He stressed that in their current condition, the fuel cells are fully operational and "we have no violation of our launch commit criteria. The fuel cell works fine on two phases and it has been working fine since we turned it on and there is certainly the probability it will continue to work fine for the full duration of the mission." "What we have here, however, is a signature which is a new engineering indication that casts some doubt on the health of that fuel cell and whether it would be able to support the full 12 to 14 days we want to fly this flight," he said. Asked why this option was more attractive than simply changing out the fuel cell, waiving the daylight launch requirement and flying at the end of the month, Hale said other than the fuel cell issue, Atlantis is ready to fly. "What it is, we're all suited up. The crew's here, all the teams are here, the shuttle's out on the pad, everything's ready to go and from a program management standpoint, you always say is there a reasonable way we can decide it's safe to fly? "If we cannot prove it's safe to fly, we won't fly," he said. "That's the principle and I stand beside it. The real puzzler to this is the condition we are in is not an unsafe condition. Our engineering requirements documents say as we are, it's good to go fly. What we have taken here is an extra look at safety. We've gone above and beyond what our safety requirements are (but) we think it is prudent that we understand (the issue) fully before we go commit to fly." The official crew patch for the STS-115 mission of space shuttle Atlantis to resume orbital construction of the International Space Station.